At Emage we listen carefully to understand your training needs and build a custom program of relevant training. We have been providing premier training and mentoring in various technologies and processes. Our unique strength, focus, and depth of talent needed to help our students build their IT career. Emage’s training instructors and course designers bring in years of wide variety of professional experience to our team, and more importantly, into your classroom. Our unique consultative approach to learning ensures that the students receive benefits well beyond what exists in the training manual, each and every time. At Emage our goal is to ensure each participant leaves the training program acquiring the necessary skill and confidence to deliver the support needed as well as with an understanding of how your specific applications are important to achieve success in business. We currently offer web based / in class training in various technologies. 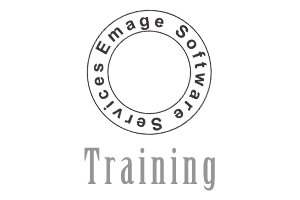 Please send an email to training@emagesoft.net for course details or course schedules. We promise to get back to you within 24 hours.